Federal Reserve raising short term interest rates? Stocks ready to rally? While the short term down-trend is still in place, a lot of stocks I watch are gaining strength. 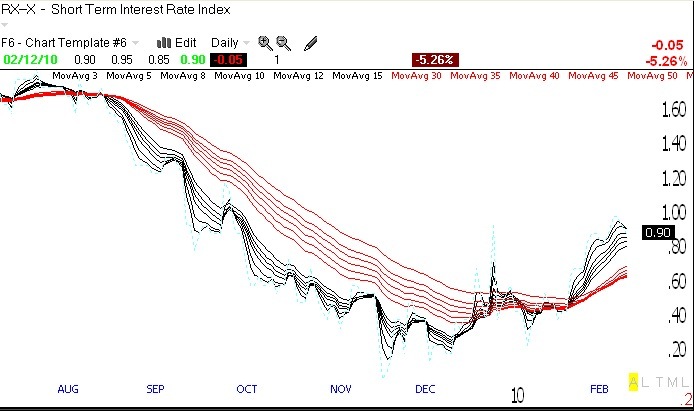 And surprisingly, short term rates are starting to rise, perhaps in anticipation of a recovery in the economy. First, note that the GMI-R, which is more sensitive to short term changes, has risen from 1 to 5 (of 10), while the GMI is now back to 2. As the table below shows,we have just completed the 16th day of the short term down-trend. But note there were 83 new highs in my universe of 4,000 stocks last Friday, up from 18 the prior Friday and the most of any day last week. The Worden T2108 indicator is now at 31%, out of oversold territory, and 48% of the Nasdaq 100 stocks have their MACD above their signal line, twice as many as the prior Friday. A lot of growth stocks are starting to rebound, so I am ready to go long if the indexes can rise through their critical moving averages. The Fed may be letting short term interest rates rise, possibly in reaction to a stronger economy. 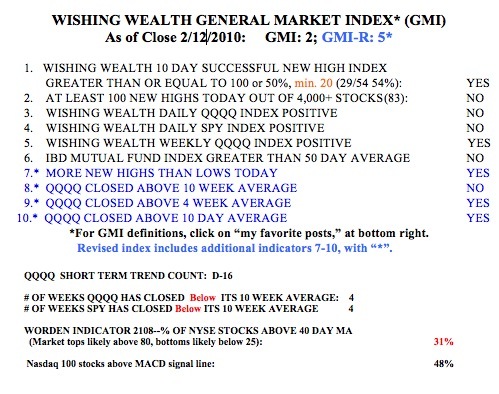 The Guppy daily chart (GMMA) below shows that the short term moving averages (black) of the interest rate indicator are now above the longer term averages. The GMMA chart of the dollar (not shown) provides a similar, even stronger up-trend.